When is it best to use a spader? Farmax Spaders will be at the Yorke Peninsula Field Days. Drop by the site, have a look at a Farmax Spader and ask any questions you may have. We would love to see you there. 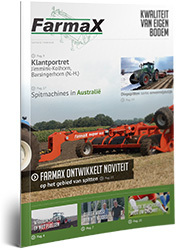 In this magazine, we will explain the spading method of soil preparation and state its advantages in comparison with ploughing. Read the article on page 17 about Spaders in Australia.